Image Size 20.75 x 16.5 in. Erik Olson was born in Calgary in 1982, and graduated from the Emily Carr University of Art and Design in 2007. Following university, Olson travelled extensively, studying painting at artist residencies in Canada, Italy and India. Olson self-curated his first solo show in an abandoned gas station in 2008. Since then, his paintings have been recognized by curators and galleries which has led to exhibitions at the Glenbow Museum, MOCA Calgary, Art Gallery of Calgary and the University of Wisconsin/Milwaukee Union Gallery. From September – December 2018 at the Glenbow Museum in Calgary, Olson is included in a three-person exhibition entitled “Cosmos”. Olson exhibited paintings from his 2011 “Space” series along with night sky paintings by Gathie Falk and beaded reliefs by Margaret Nazon. In 2014, Olson moved to Düsseldorf, Germany to study at the Kunstakademie Düsseldorf as Peter Doig’s guest student. He currently lives and maintains a studio in Dusseldorf. In December 2016, Erik Olson worked with master printmaker Peter Braune of New Leaf Editions in Vancouver, BC. Olson entered the collaboration with the idea to make two new unique etchings based on two recent paintings: “Face Paint”, the face of a woman with a polka-dot collar and “Weltbild”, a self-portrait of the artist’s torso. 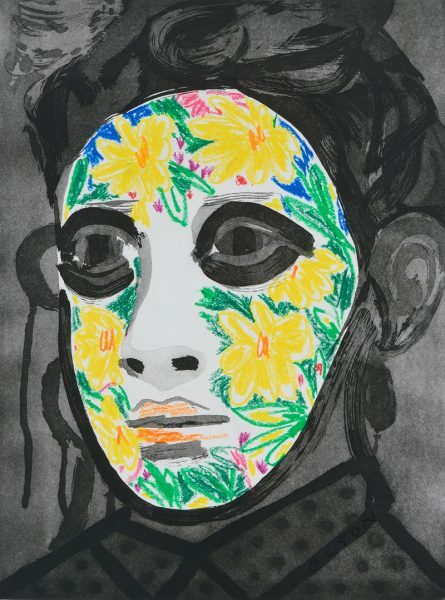 “Face Paint” was printed with the intention that Olson would hand-colour each print individually with pastel. Each etching within the edition of 15 is therefore unique. Each print continues Olson’s colourful exploration with portraiture and his relationship to place.